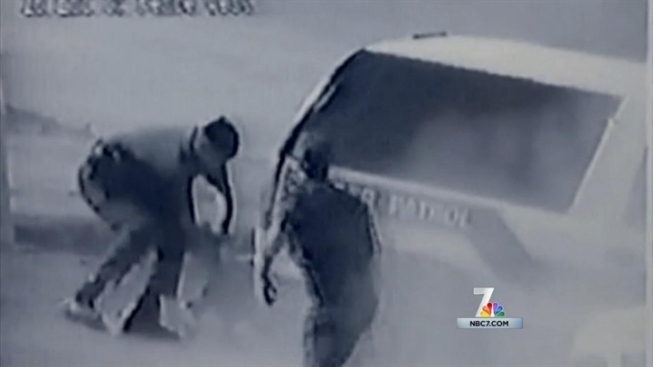 Activity and assaults against federal agents patrolling the U.S.-Mexico border have increased. Now, one field agent tells NBC 7 San Diego that agents from other parts of the country are being called in to help patrol. Jerry Conlin with U.S. Border Patrol said the agency saw a 70 percent increase in assaults against U.S. Border Patrol agents last year over the previous year. "In 2011, we actually recorded 77 assaults against our agents," Conlin said. "Last year we had 133." There have been another two assaults this week on agents patrolling in the San Diego, Calif., region alone. On Monday, a U.S. Border Patrol agent was struck twice in the face by a man intercepted near Otay Mountain. The suspect was eventually taken into custody and faces charges of assault on a federal agent. Then Tuesday, about a mile west of the San Ysidro crossing, an agent spotted four people jump the fence. When the agent arrested one of the men, the other three jumped back over the fence. “As he was placing this individual under arrest, the three individuals started throwing rocks from south of the fence," Conlin said. "Rock throwing is probably the most common form of assaults," he said. While rocks are the most common weapon, agents need only remember back to 2009, when Agent Robert Rosas was ambushed and shot to death by a group trying to steal his night vision goggles. Conlin says a week with two separate assaults on agents is a reminder to all of them. "Anytime we see assaults go up, it's just a reminder of how dangerous it is and how we always have to be aware of our surroundings and protect our fellow agents," Conlin said. NBC 7 San Diego spoke with one field agent working near the border Wednesday night who said there has been a lot of activity near the San Ysidro border crossing lately. So much so, he said, that they're calling in agents from other parts of the county to patrol here.